Display all your favourite photographs from the wedding in this fantastic photo album. 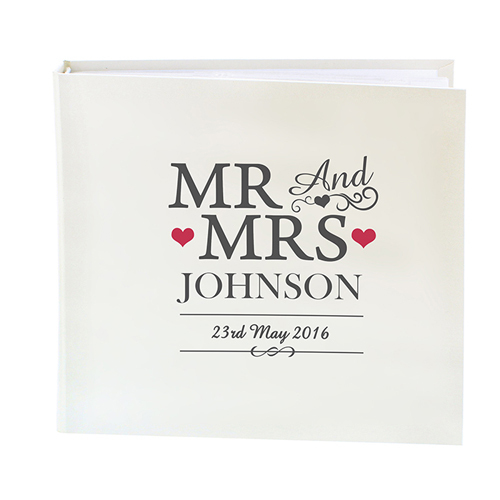 This Personalised Mr And Mrs Album with Sleeves can be personalised with a surname up to 15 characters and a date up to 20 characters. 'Mr And Mrs' is fixed text on this item. There are 25 sleeved pages (50 sides), in this deluxe satin sheen finish bookbound album. With a sleeve all the way along the edge of each page, this flexible album allows up to 2x (6" x 4"), 1x (7" x 5") or 1x (8" x 6") photos per side. Personalise with a surname up to 15 characters and a date up to 20 characters.